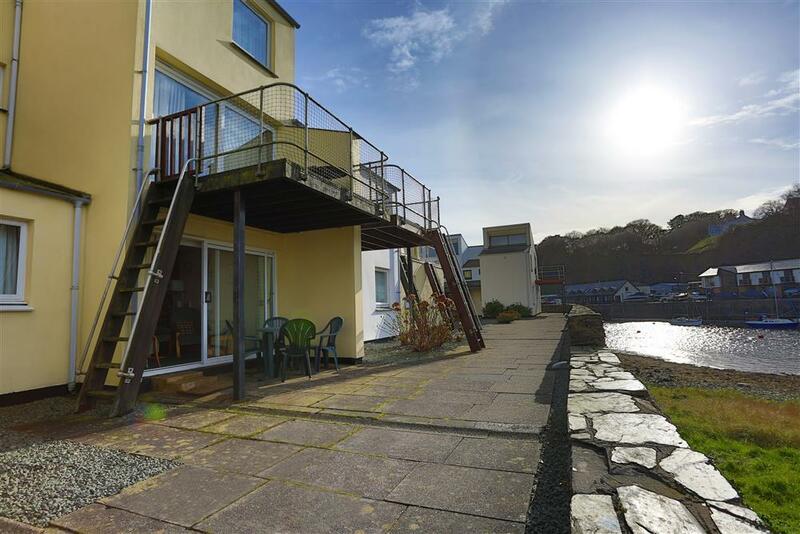 This very comfortable ground floor apartment overlooking the harbour in Porthmadog is ideal for guests wanting to refresh their batteries with some sea air. With all rooms on the ground floor and level access to the many shops in Porthmadog the convenience of this property means that it is ideal for all guests . The 10ft wide picture window in the living room opens the apartment to the ever changing scene of the tide, bobing boats and wildlife before you in the harbour - perfect for relaxation in the evening sun. A short walk from the propery will lead you to the Ffestiniog Railway and Welsh Highland railway and the station's popular bar/restaurant. Porthmadog has many restaurants, cafes, shops, and a leisure centre. Snowdon and Beddgelert (7 miles), Portmeirion Italianate styled village (3 mls). Harlech, a World Heritage Site, with its majestic castle stands 10 miles away. 2 BEDROOMS: 1 Double bedroom, 1 bedroom with two Single beds. Linen included for all bookings made after 16/2/19. SHOWERROOM/WC: Walk-in shower (shower tray with full length screen). LIVING ROOM: Fantastic harbour views. Open plan lounge/diner/kitchen. KITCHEN AREA: Electric oven and hob, microwave, fridge, peninsula worktop table with four bar chairs. LOUNGE AREA: Comfortable seating for four, Freeview flatscreen TV & DVD. GROUNDS: Patio overlooking the harbour with garden furniture. HEATING: Night storage heaters throughout. PARKING: 1 designated parking space outside the apartment. LINEN: Linen included for all bookings made after 16/2/19. Price Group: 12 without linen for bookings made up to 16/2/19. 2019 Price Group: 13 with linen for bookings made after 16/2/19. Mini-break rules at this cottage: A mini-break is a holiday for less than a week and/or may start on a day which isn't the normal changeover day (Saturday). This property owner will only accept mini-breaks at medium notice of 21 days between Easter and October Half Term. Outside of this time mini-breaks are bookable 56 days before the holiday. Mr P (Sept 2016): "Very pleasant stay in spotless property." Professor R. O. (April, 2014): "A perfect stay, with so much to relish, including the harbour at night with its lights twinkling in the water and, of course, the majesty of the mountains!" Mr & Mrs B (June, 2014): "What a great time we have had once again. Two weeks of nothing but the sun, all day and every day. Thanks again!" Mr & Mrs L (August, 2014): "Very nice apartment, lovely views, good weather most of the week. A very good weeks holiday!" Mr & Mrs A (August, 2014): "My son and I thank you for staying at your flat for a wonderful holiday. North Wales is very dear to our hearts." H family (August, 2014): "Nice apartment with great view. Plenty to do in area. Thanks!" B & S (September, 2014): "Wonderful week had by all. Look forward to our next visit!" 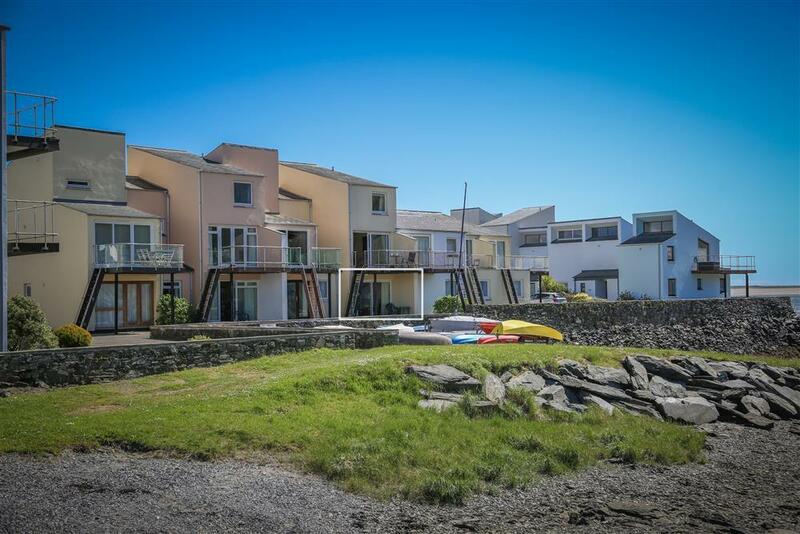 "Ground floor apartment set on the marina in Porthmadog. The apartment offers excellent views of the harbour with patio doors opening onto a small patio area." This ground floor flat is in a purpose built holiday property within a private complex. Approach is from a main road into tarmac drives throughout the estate.The designated parking is suitable for one vehicle and is in a well-lit area just 10yds from the property. Access to the flat is up one concrete step with grab handles on both sides of the door. The flat has a standard size solid wood front door leading into a compact hall area. From this area there are doors to the bathroom, bedroom and the open plan living area with galley kitchen. From the living area there is a sliding patio door to the patio which is down one step.There is good lighting throughout the property with both a ceiling light and a lamp in the living area, a strip light in the kitchen area and spotlights and matching bedside lamps in the bedroom.The bathroom room has a bath with electric shower over the bath, hand basin and WC. There are a couple of grab rails on the wall to help get in the bath to take a shower and to help get out of the bath. Again there is good light with a ceiling light and shaving socket and light.The flat is quite compact and not suitable for wheelchairs however, outside the front door there is room to park a mobility scooter and plugs in the hallway to recharge but no room to store inside.